Merrydown by McLaren - The Hieno! 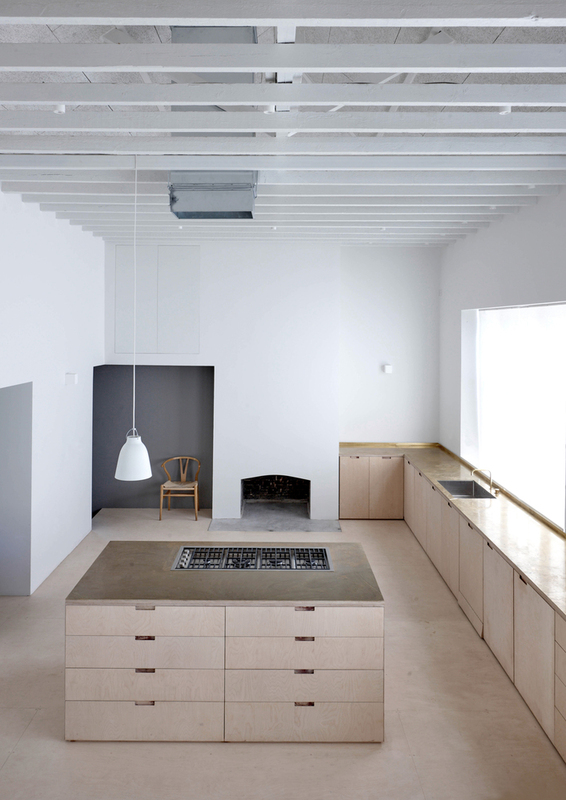 Merrydown is a minimalist house located in London, England, designed by McLaren Excell. The house was originally a single story home occupied by the client’s mother. The original layout placed the various programs in a cell-like formation having bedrooms and bathrooms on one side of the single corridor. In order to increase the square footage of the space, the architects were briefed to gut renovate the entire space and to try and take advantage of the building’s unique form factor, as well as create additional space on an entirely new level. The final scheme resulted in three bedrooms, two bathrooms, an open plan living space, and a double-height kitchen. To the generous ceiling heights, the architects decided to utilize empty voids by suspending a series of roof joists that provided the home with an additional story without underpinning the perimeter walls or increasing the height of the roof structure. A focus on pure materials such as birch plywood, concrete, wood wool, and brass materials tied the space together.